This past week The Walking Dead has gotten into worldwide news, this time around not due to complaints of extreme violence, instead due to an incident outside of the show. What it does share in common though is Negan and his infamous baseball bat Lucille. Don't worry about spoilers for the latest season of The Walking Dead as there are none to be found! "We were shocked when we came face to face with a new t-shirt with a racially explicit graphic and text. It was fantastically offensive and I can only assume that no one in the process of ordering it knew what they were doing or were aware of it's subliminal messages". Due to this Lucraft felt compelled to write a stern letter to the store demanding that what he saw as an offensive shirt was removed. Primark of course immediately complied. This was totally reasonable, as with a world population of 7.5 billion people if just one of those people should personally find something offensive then by all means remove the offending item. While the minister has been getting a lot of the flack it is Primark's knee jerk response that is the real issue here, it was pathetic they bowed down to one person's wishes for fear of getting bad publicity (when I am sure they can't be thrilled with how that has turned out for them). Obviously Ian Lucraft had no idea whatsoever it was from The Walking Dead, in his mind it somehow was a calling anthem for white people to rise up and kill black people with a baseball bat wrapped in barbed wire or something? To be fair until around the 1960's there was a racist connotation with that rhyme, however nowadays that is all but forgotten, to me it seems it was only Mr Lucraft himself who brought it back into the public consciousness. Personally I had never heard his version until he spelled it out. The world has moved on a lot since the days of his youth, sure it is not perfect but the process is ongoing. As for Negan, going by the TV show portrayal of his character there is no indication that he is racist at all. Wow, that was a long spiel from me, all that was to say that I was Sir Tom Petty of Pettyton-on-Sea and felt compelled to buy the offending t-shirt (well, a variation of it). 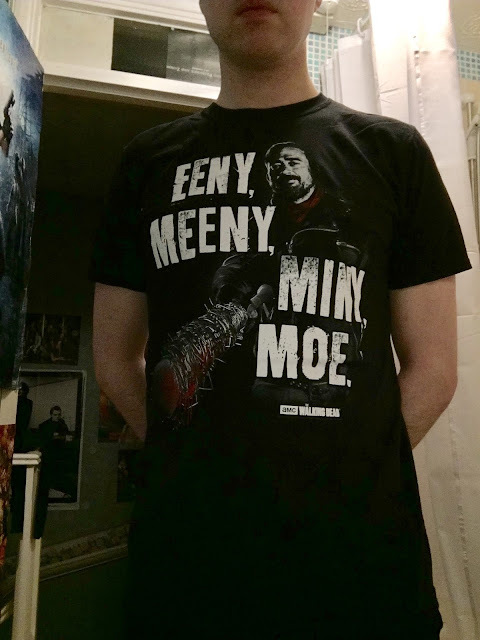 I don't usually buy clothes with slogans on them, or with pictures of people on them, but in this instance to make a point of the stupidity of the 'Sally Sensitive' goings on I did. People should focus on the real racism in our world and not go out of their way to make things up to ease whatever hidden white guilt they themselves may live with. As for the horrendous photo above; I don't usually profess to be a model.